Equal parts aggressive and agile, the R5 is a mid-sized runabout that delivers a ride unlike any other. And while the R5 still offers the luxury and performance you expect from a Cobalt, its sleek profile is what really turns heads. 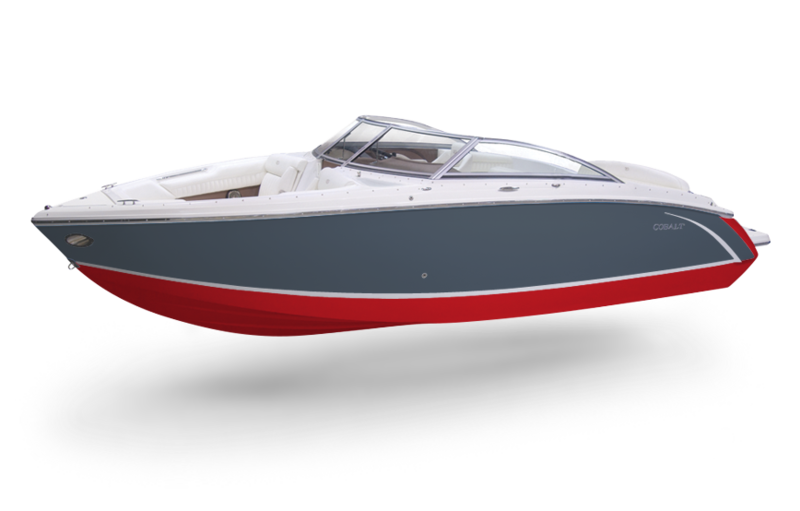 With a walk-thru transom, swim platform and sun pad seamlessly integrated into the R5’s cohesive design, the result is a boat that strikes the perfect balance between form and function. 12v outlets provide necessary power to mobile devices on-board. Cobalt's exclusive leather wrapped steering wheel provides the ultimate in style and control. Depth & Water Temp Pkg. Illuminated stainless steel switches with laser etched identifiers provide the perfect amount of lighting to the switch panel. Control all stereo functions from the convenient dash mounted head unit. Easily accessible, upholstered head compartment. Shown with removable Porta Potti. Dual position port side seating with a fore and aft adjustable backrest and passenger flip up seat. Storage is located beneath port side seating. Lounger converts from standard seating configuration to sun pad or rumble seat. Protect the gelcoat from trailer hook damage with the unparalleled bow scuff plate. Both fashionable and functional, the bow scuff plate from Cobalt is through bolted and designed custom for every Cobalt. A set of Custom Stainless Fender Clips, which provide a solid and secure place to hang the fenders. Includes the insert, the receptacle, and fender lines. 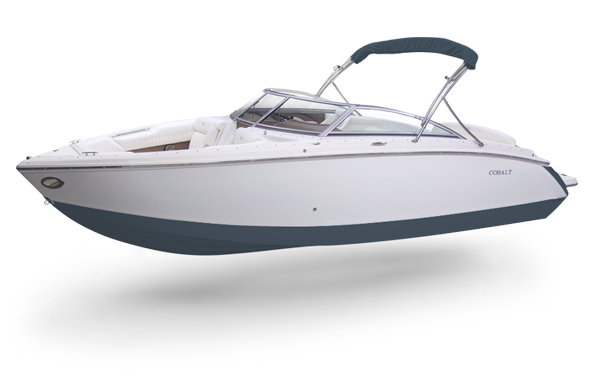 The Cobalt patented swim step is designed for boating simplicity. A stainless latch releases the step for recessed storage or simply deploy for boarding. Standard engine ignition safety switch with belt clip. Solid stainless steel windshield support stanchions. Installation will vary depending on specific boat model. Battery switch disconnects the single engine battery from entire vessel, with the exception of the bilge pump and stereo memory. Stainless steel circuit breakers can be reset with the touch of a button, and provide surge protection for the electrical system. Installation will vary depending on specific boat model. Sunbrella Canvas bow cover with stainless steel snaps and velcro which attaches to cockpit cover. Sunbrella Cockpit Cover with stainless steel snaps custom designed for each Cobalt (including those boats with an arch or Bimini top). The ultimate in weather protection, our mooring cover is custom built for each Cobalt model. The custom cover includes velcro closures around the tops, and stainless steel winches on the gunwale straps, and tent poles to prevent water pooling. The R-5 dinette table with cockpit and sun pad receptacle provides the availability of placing the cockpit table at either location in conveniently placed stainless steel brackets. Sea Grass floor covering creates an elegant and comfortable style to the interior of any Cobalt. Rubber backing and stainless steel snaps make it as durable as it is elegant. The upgraded porcelain head with holding tank and dockside receptacle. The Electric Porcelain head with macerator provides for overboard discharge. Local restrictions and laws apply. Easily accessible, upholstered head compartment. Shown with fixed Porta Potti. Remote lighting is as simple as the touch of your key fob. Easily accessible, upholstered head compartment. Shown with porcelain toilet and sink console. Stainless steel with rubber tread, the footrest instantly becomes an interior detail worth bragging about. 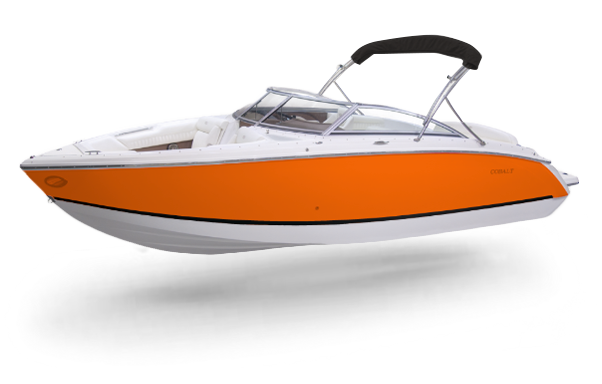 Size and shape will vary slightly for custom fit to specific boat model. port side aft removable filler cushion mounts in the same hardware as the dinette table. Port side aft cushion and stainless steel mounting hardware. Pillows are filled with 4 pounds of Vyram weighted pellets for stable placement while boat is underway. Available in five Sunbrella outdoor fabric colors. Size: 22 x 22 inches. The docking lights with stainless steel trim rings. Stainless steel opening portal light with screen located at port side head compartment provides adequate ventilation and ambient sunlight. LED transom lighting provides the appropriate level of illumination for the perfect evening of entertaining friends. Shown on model 242 with standard swim platform. Freshwater wash down with pressure water system and fresh water tank. Control the drive trim adjustment at the transom for utilization while trailering or dockside. LED underwater lighting system includes two light pods and the switch module. Beautiful evenings begin with illumination. Shown on model 302. Swim platform transom lighting also shown. Convenient access to screwdrivers, pliers, and a crescent wrench with customized sunbrella storage container. Recessed anchor windlass is mounted below decks in the anchor locker. Cobalt uses a through hull mounted hause pipe made of stainless steel, and a stainless delta style anchor with 80 feet of chain and plaited line. Installation may vary depending on specific boat model. The clamp-on design is extremely solid and secure, but easily removed. A single tension knob will loosen the clamp and arm articulation for adjustment. Just position and lock everything down. Heat sensitive automatic Fireboy system mounted in the engine compartment designed to instantly eliminate flames in the event of an engine fire. Installation will vary depending on specific boat model. Built in battery charger located in the engine compartment with external power connection at the transom. Dual battery and voltage sensitive relay provides instant accessibility emergency power. 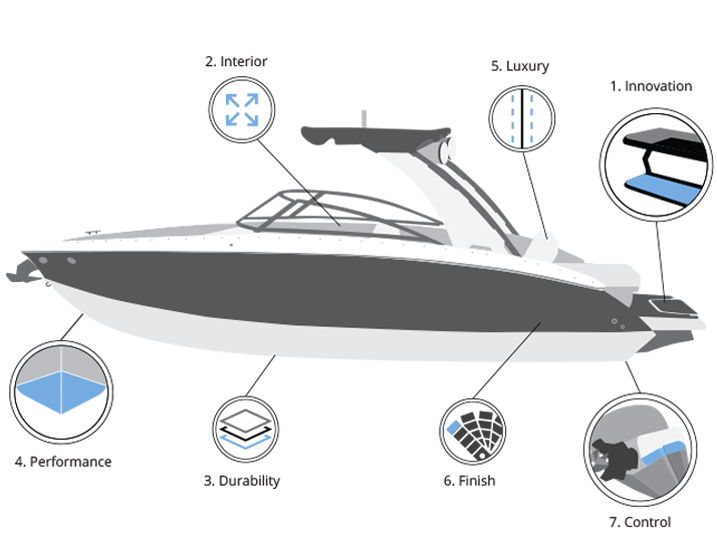 Installation varies with specific boat model. Beautiful, great boat! Our second one in two years and we really enjoy it. Has everything we need - are having a blast with family and friends. "The boat, correspondence from Cobalt (down to the smallest of details) and extras like the black Cobalt bag all exceed our expectations. 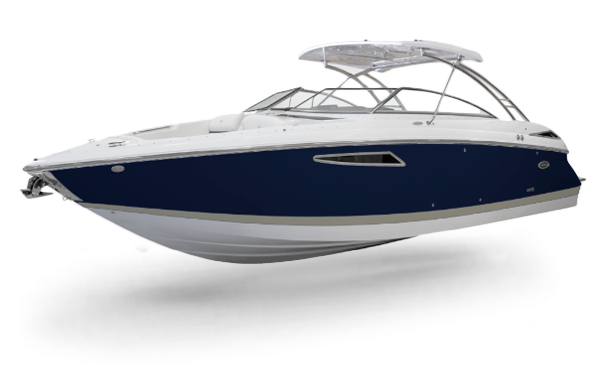 We love our new boat and view Cobalt as a top world class manufacturer." 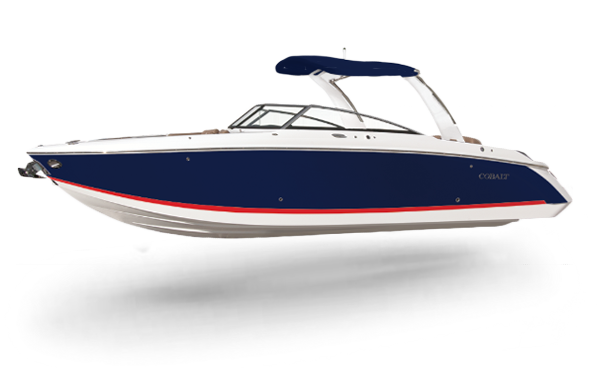 In my opinion, no other boat matches the quality I have found in Cobalt. The design is very appealing to my eye. I am looking forward to a plant tour, in the near future, at Neodesha. This is my 2nd Cobalt and I couldn't be happier. It's a beautiful boat and provides a wonderful outlet for family enjoyment. Many thanks to you! I expected a professional dealer, and that was the experience I had. The boat has been all I had hoped it would be and more. I'm 40 years old and owned 10 boats. I've never been as satisfied with any other boat. I'll always own one (a Cobalt that is). Sign up to receive the Cobalt Newsletter! Enter your name and email address below to subscribe.